Foundation makeup is meant to look natural and enhance someone's skin. The goal is to notice the skin, not the foundation. When you apply foundation makeup correctly, you will have an even application with a flawless finish. Always start with clean, dry, and lightly moisturized skin. Apply foundation by dotting it on your forehead, cheeks, chin and nose, and then blend, blend, blend. If you don't want complete coverage, apply just in the needed areas. Don't forget to blend into the neck and around your hairline. You can use various tools and techniques when applying foundation makeup, depending on the results you want. You quickly and easily can blend cream foundation onto your face with your fingers; no other tools are necessary. Make sure that your fingers are clean before you apply the makeup. When you use your fingers, blend the foundation onto the skin with upward, outward motions. Alcohol-based foundations are usually rather thin, dry quickly, and can be tricky to blend. You can apply them most easily with a damp cotton ball or pad. Work one section of the face at a time. Remember to shake the foundation bottle frequently to make sure that the product has not separated. You can apply water-based liquid or cream foundations with a dampened sponge. By using sweeping motions with a sponge, you will achieve a blended, natural look. You will use less foundation and get a smooth, even look if you apply your foundation with a sponge. You can apply liquid foundation with an airbrush for a smooth, flawless finish. Instead of applying one heavy coat, foundation should be airbrushed on in extremely thin layers. If you can see the makeup, you have used too much. Professional make-up artists generally prefer this application method. 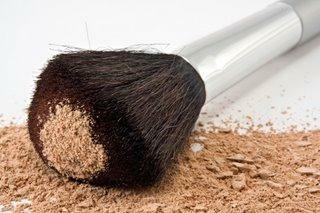 Use a large, fluffy brush to apply powder and mineral-based foundations. Dip the brush into the powder, tap to remove excess foundation, and then brush onto the face in a circular, buffing motion. You can also use translucent powder over your foundation to help set the foundation and reduce shine. Different foundations, as well as different application techniques, lead to different degrees of coverage. Sheer foundation provides the most translucent coverage, and contains the least amount of pigment. Alcohol-based foundation is typically very sheer, and does not hide discolorations and other flaws. If you have very light freckles, highlight them with sheer foundation instead of trying to cover them up. Light foundation, which contains approximately 15 percent pigment, will hide unevenness and blotchiness, but will not cover freckles. Medium coverage foundation will cover freckles, acne, and blotchiness, especially when it is set with a tinted powder. Sometimes called corrective makeup, full coverage foundation is extremely opaque. Makeup artists use it to hide birthmarks and scars, and for stage makeup. It may contain up to 50 percent pigment. The best way to determine the proper foundation shade is to test the foundation on your jaw line and see whether it matches the natural color of your neck. Don't color test foundation on your hands or wrists; your face color will be different. Don't forget to blend your foundation under the jaw line, into the hairline, on the ear lobes, corners of the nose and mouth, and over and under the eyes. When blending, press gently all over your face with the pads of your fingers. The warmth of your fingers will aid in blending the foundation. Before you're through applying your foundation, go to a natural light source and check your application. Foundation is meant to enhance a person's natural beauty, not to create an artificial, mask-like appearance. Since foundation is undoubtedly something you will wear almost every day, take the time to select the best formula and shade for your skin type so that you will get the most for your investment.